That day, the shuttle Columbia was returning from a 16-day trip to space devoted to science research. But what began as a routine re-entry through Earth's atmosphere ended disastrously as the orbiter disintegrated about 200,000 feet (61 kilometers) over Texas. Later analysis found that Columbia was doomed during its launch, when a small bit of foam insulation broke off the shuttle's external fuel tank and tore a hole in the orbiter's wing. That hole prevented Columbia from withstanding the scorching heat of re-entry. All of the lessons the agency learned were incorporated into every subsequent flight NASA flew, and are now being used to inform the design of its next-generation spaceship, Orion. That vehicle is slated to carry people to asteroids, the moon and Mars sometime in the mid-2020s. "We're hoping nothing ever goes wrong, but if it does, we've taken every possible step to keep the crew safe and give them every possible fighting chance they can have," said Dustin Gohmert, NASA crew survival engineering team lead, at Johnson Space Center in Houston. "It's especially important to us that were here during the Columbia accident, because they were our friends, too." A mockup of the Orion capsule at NASA’s Johnson Space Center in Houston shows the space agency’s next-generation spacecraft, designed to carry humans beyond low-Earth orbit to the moon, asteroids, and Mars. 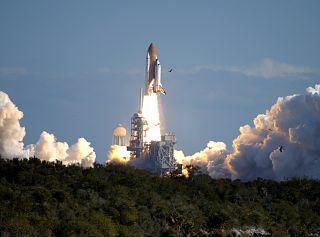 The Columbia investigation exposed a number of flaws in the design of the shuttle's crew cabin, including its seats, seatbelts, spacesuits and life support system. Each of these has been redesigned for Orion. "The seats were one of the weaker links during the Columbia accident," Gohmert told SPACE.com. "We wanted to make these seats formfitting so they had a true fit to the body's shape." NASA looked to the formfitting seats used in professional race vcars, which provide even support to every part of the body, offering extreme cushioning and shock absorption during a crash. Orion designers even fine-tuned the vibration frequency of the seats to have different resonances than the internal organs of a human body. The engineers also redesigned the seatbelts, which were another issue during Columbia's flight. Here, they took inspiration from the belts on children's car seats, which are adjustable to fit a wide range of body sizes. "We wanted an exact fit for every single person who could fit in the vehicle, from females down to 4'10" and males up to 6'4"," Gohmert said. "It was quite a challenge." "In the case of Orion, the suits will instantaneously, and without any action of the crew, inflate and protect from the loss of pressure," Gohmert said. The capsule life support system was also upgraded to provide a constant flow of oxygen to the crew, even with their helmet visors up and locked, which wasn't possible in the shuttle. Each of these changes addresses flaws exposed by the Columbia shuttle disaster. Yet Gohmert said none of these upgrades alone would have made a difference during the disaster. "I caution against saying that any one thing we've corrected would have protected against the outcome," he said. "However, we examined all the lethal events that occurred in Columbia and addressed each of them in the Orion. We're doing a whole lot of things to make it safer, and everything we've learned from the shuttle accidents, from Russian space accidents, automobile accidents — we've taken lessons from all of them and tried to incorporate them into Orion." Perhaps the largest change from shuttle to Orion is the shift from a winged space plane design to the cone-shaped capsule, which sits atop the rocket rather than next to it. "When we went to the capsule, we went from a side-mounted spacecraft to a forward-mounted one," said Julie Kramer White, Orion chief engineer. "Therefore, it's not exposed to debris environments, which was obviously a huge issue for Columbia." This configuration also allows the crew compartment of the capsule to be ejected from the top of the rocket stack in the case of an emergency on the launch pad or during liftoff. Such an escape would not have been possible for the crew cabin of the space shuttle. Of course, the shuttle had capabilities that no capsule has — namely, the ability to haul large, heavy cargos, such as the building blocks of the International Space Station, inside its cargo bay, White pointed out. Moreover, the culture of safety at NASA has changed for the better since the days of Columbia, Gohmert said. "The reaction has been very positive around all of NASA in terms of giving us the capacity to make these safety improvements," he said. "Previously, it was difficult to implement some of the safety features as we'd hoped. Now it really is on the forefront of everyone's mind."